Fall is now in full swing, with the maples reddening in the late afternoon sunlight and the frost painting the blades of grass in crisp silver triangles each morning. Fall is a wonderful time to enjoy nature and poetry together before the cold winds of winter blow by. 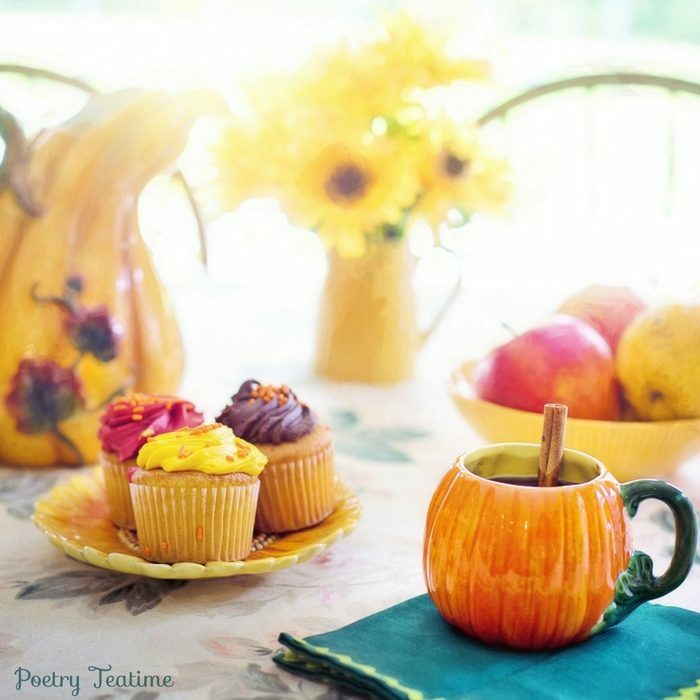 Take time during your teatime to go outside, breathe in, and enjoy the delights of autumn. 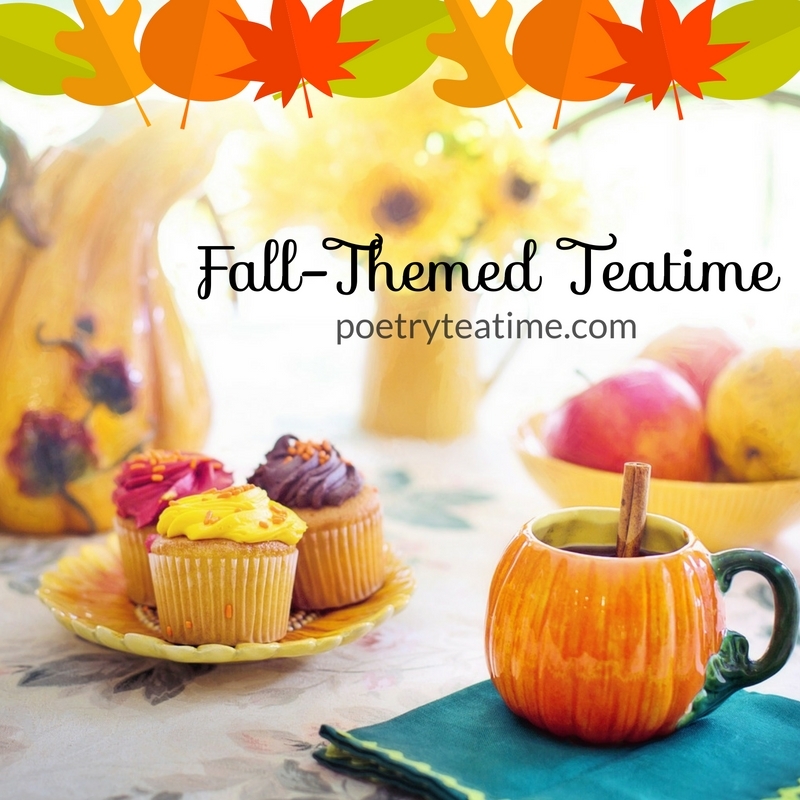 There are so many beautiful poems about fall that we could spend an entire month of teatimes on the delights of harvest and the slow descent into winter’s chill nights. Shakespeare offers a delicate hint of autumn in the following sonnet. Shakespeare’s poem captures the short-lived delights of fall so perfectly. A shorter and equally captivating poem is “November Night,” by Adelaide Crapsey. Crapsey's poem is so short and yet packs beautiful sensory images and the wonders of wordplay. As the above poems suggest, poetry about fall, whether specifically for children or for general audiences, contains the magic of a special time of year. Fall-flavored brews: brew some chai spice tea or a cinnamony cup of tea. Serve hot apple cider or hot cocoa--with marshmallows, of course. Or, make your own apple cider from scratch using this recipe from Smart School House. Roasted pumpkin seeds: Keep all those seeds from the pumpkins you’ve been carving! You can roast them and enjoy them as a delicious snack. This recipe from Home Cooking Memories offers a wonderful guide to creating that mouthful of sweet and salty crunch from pumpkin seeds. Caramel apple bar: You’ll need many apples for this recipe, as well as chocolate sauce, sprinkles, caramel, crushed nuts, and any other toppings you’d enjoy. Check out the directions, tips, and fabulous images on Craftberry Bush. Other cute finger food: Create these easy and oh-so-adorable deviled egg “pumpkins” on Tadka Pasta. Cut your carrots in the shape of these simple and fun carrot “pumpkins” on Little Dairy on the Prairie. Autumn is one of the easiest times to decorate, because you can simply grab a handful of fall leaves, some acorns, and a few pinecones and make a gorgeous centerpiece for your table. If you’re looking to add some spice to your typical fall decorations, though, you’ll find some ideas below! Pumpkin-themed decor: If you have any pumpkins lying around the house, try painting them a light color, then using sharpie to write quotes about fall, things that the family is thankful for, or favorite moments in fall. Use this pin from Good Housekeeping for inspiration. For a simple paper craft that produces lovely pumpkin shapes from strips of colored paper, follow these directions and gorgeous pictures on Meaningful Mama. Supplies: pumpkin, light-colored paint, paintbrushes, sharpie; strips of colored paper, scissors, tape. Nature Walk Leaf Faces: Go on a nature walk and collect fallen objects. Grab glossy acorns, glinting leaves, prickly pine needles, or anything else that catches your eye. Then, arrange your items in faces: use the acorns for eyes and the pine needles for hair, for example. If you’d like, make the leaves into dresses for magical woodland creatures. Be sure to name your nature creations! Inspiration: Making a Leaf Face on TeachWithMe.com and this cute post on fall activities from Learning in Spain. Kindness Postcards: This activity is related to harvest as a time to give thanks and give back to others. Take the leaves you collected on your nature walk and glue them to cards or bookmarks. Then, write notes of appreciation or thanks, or write short haikus or poems for other people on the back of the bookmark or card. Create something to give to someone else during this time of celebration and giving thanks. Inspiration: Kindness Postcards on Growing Book by Book. Be sure to check out these suggested books and poems about fall on Miss Rumphius Effect. Use the Poetry Foundation’s list of fall poems as a resource for older kids (you may wish to preview the poems before sharing them with the whole family).